Background: Primary squamous cell carcinoma of the thyroid (PSCCT) is a rare malignancy of the head and neck, with fewer than 60 cases reported in the literature. We report a case of PSCCT and provide a brief review of the literature. Case Report: A 66-year-old female with a history of a hemithyroidectomy for a benign thyroid lesion presented with 3 months of progressively worsening compressive symptoms and shortness of breath. Physical examination revealed right-sided thyromegaly and right-sided true vocal fold immobility. Preoperative imaging with ultrasound and computed tomography scan confirmed an enlarged right thyroid, as well as right anterior cervical lymphadenopathy, subglottic stenosis, and bilateral pulmonary nodules. Fine needle aspiration of the thyroid was suggestive of carcinoma. Intraoperative findings of gross tracheal invasion during a planned completion thyroidectomy prompted limited resection and impromptu tracheotomy. Histopathologic and immunohistochemical evaluation confirmed a squamous cell carcinoma of thyroid origin. Further oncologic workup with core lung biopsy and positron emission tomography scan demonstrated metastasis to the lung and cervical spine. Palliative chemotherapy was begun, but the patient died 1 week into therapy. Conclusion: PSCCT is a rare but aggressive malignancy of the head and neck. Histopathologic and immunohistochemical evaluations are essential for diagnosis. While locoregional surgery and radiation therapy may improve the length of survival, the prognosis of patients with PSCCT is poor. Physicians should be mindful of this unique but deadly disease process, as early diagnosis and rapid treatment initiation are essential to optimize treatment outcomes. Primary squamous cell carcinoma of the thyroid (PSCCT) is a rare neoplasm of the head and neck, with fewer than 60 cases identified in the literature. Patients often present with compressive symptoms secondary to advanced disease, with either locoregional or distant metastasis. PSCCT can only be diagnosed after metastatic disease to the thyroid is ruled out with surgery, imaging, or immunohistochemical analysis. While locoregional surgery and chemoradiation therapy may improve the length of survival, the prognosis of patients with PSCCT is poor.1 We report a rare case of PSCCT and provide a brief review of the literature regarding incidence, diagnosis, treatment, and outcome. A 66-year-old female presented with 3 months of progressively worsening dysphonia, dysphagia, and dyspnea. Several years prior, she had undergone a left hemithyroidectomy for a reportedly benign pathology. She denied radiation exposure or family history of thyroid cancer. Her examination revealed right-sided thyromegaly, breathy dysphonia, and right-sided true vocal fold immobility. In-office ultrasound identified a 1.5 cm right-sided thyroid nodule, and concomitant fine needle aspiration showed hypercellular, malignant epithelial cells suggestive of carcinoma. Calcitonin levels were normal. Preoperative computed tomography (CT) scans of the neck and chest depicted an enlarged right thyroid containing a 1.5 cm calcified nodule with mass effect of the carotid, trachea, and esophagus, as well as invasion of the right true vocal fold and subglottis. Right-sided level 2 lymphadenopathy and bilateral 1 cm apical pulmonary nodules were also present. A completion right thyroid lobectomy, isthmusectomy, and right central neck dissection were planned; however, intraoperative findings of extensive disease with gross tracheal invasion led to limited resection and impromptu tracheotomy. 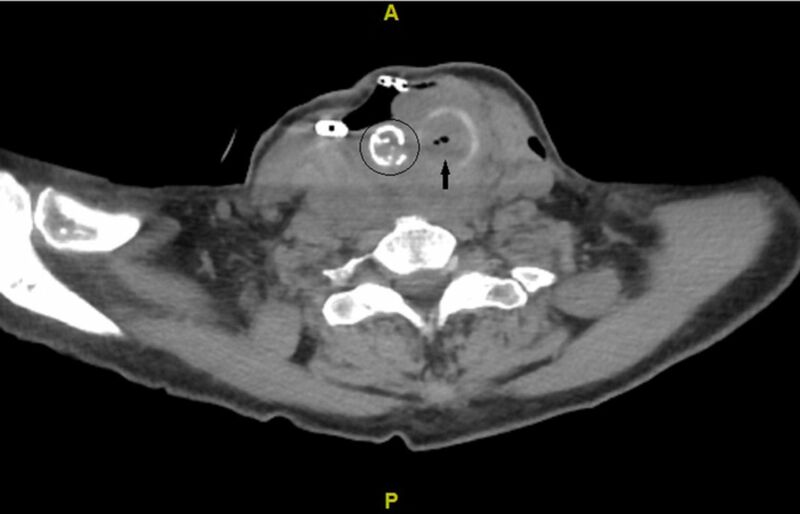 Postoperative CT scan (Figure 1) showed extensive postsurgical changes after attempted thyroidectomy, neoplastic laryngeal extension, and a 1.5 cm peripherally calcified nodule within the region of the right thyroid mass. 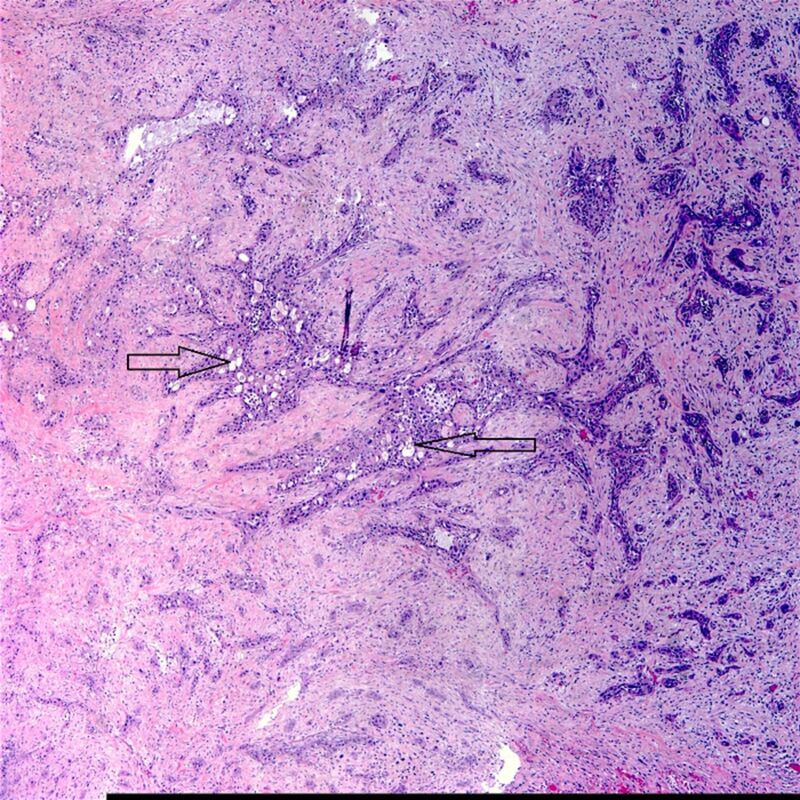 Histopathologic analysis showed an invasive, poorly differentiated neoplasm with squamous features (Figure 2). Immunohistochemistry of the suspected squamous cell carcinoma displayed positivity for endothelial markers CK5/6 and CK7 (Figure 3), negativity for TT1 and thyroglobulin, positivity for p53 and p63 (Figure 4), and diffuse PAX8 positivity (Figure 5). PSCCT was diagnosed. Further oncologic workup with core lung biopsy and positron emission tomography demonstrated metastasis to the lung and cervical spine. Palliative chemotherapy with cetuximab/cisplatin/5-fluorouracil was begun; however, the patient died 1 week into therapy secondary to respiratory compromise from suspected disease progression. The total time from diagnosis to death was less than 2 months. Axial computed tomography of the neck without contrast at the level of the subglottis depicts extensive postsurgical changes after attempted thyroidectomy and neoplastic laryngeal extension (arrow). 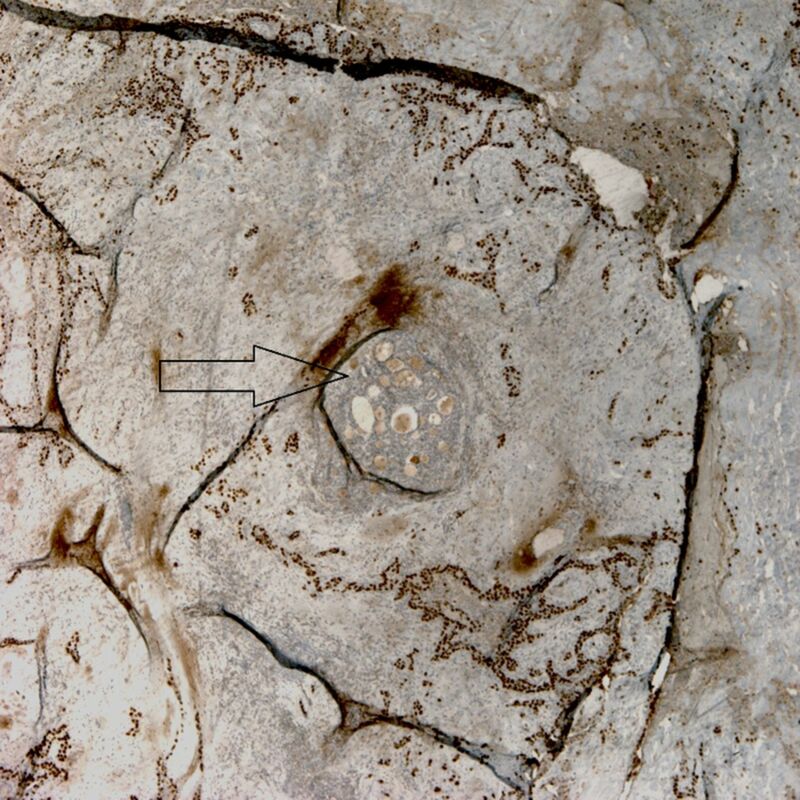 A peripherally calcified nodule measuring 1.5 cm is identified within the region of the right thyroid mass (circle). A hematoxylin and eosin stain (×40) shows thyroid tissue with an invasive, poorly differentiated squamous carcinoma (arrows). 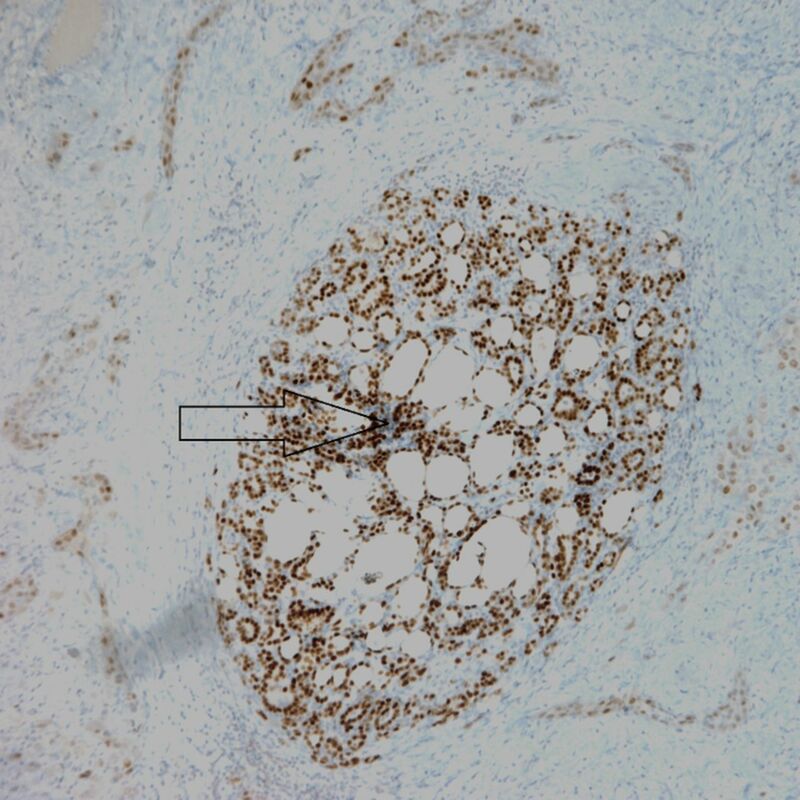 A CK5/6 stain (×20) shows a central residual focus of thyroid tissue surrounded by tumor (arrow). 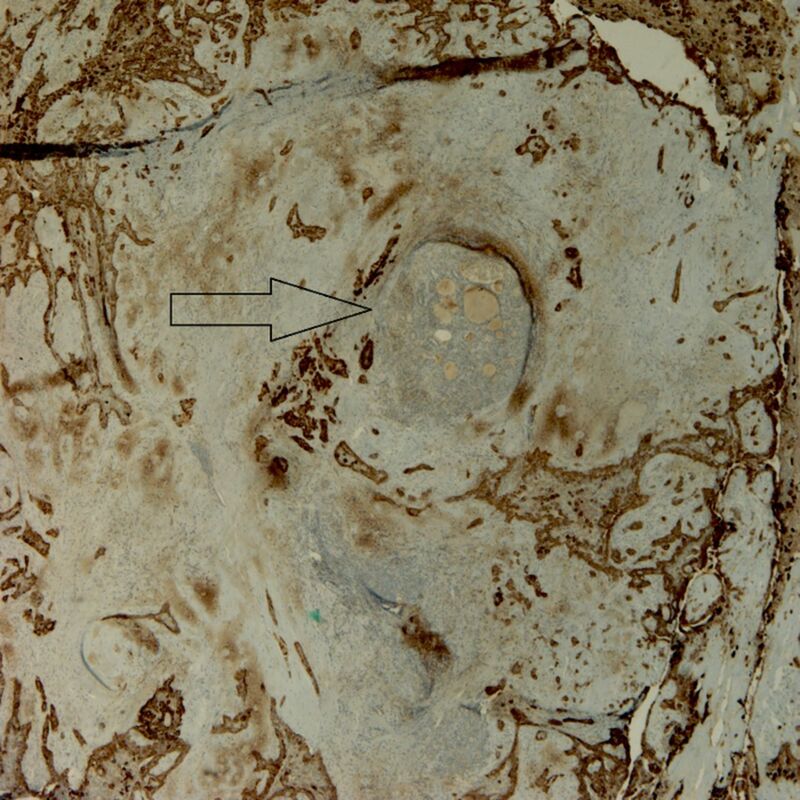 A p63 stain (×20) shows a central residual focus of thyroid tissue surrounded by tumor (arrow). A PAX8 stain (×10) shows diffuse positivity of the squamous cell carcinoma invading the thyroid (arrow). PSCCT is a rare but aggressive neoplasm, comprising <1% of thyroid malignancies.2 The pathophysiology of PSCCT is a subject of debate, owing to the absence of thyroid squamous cells under normal physiologic conditions. Three theories to explain its development are (1) an embryonic origin involving branchial arch or thyroglossal duct remnants; (2) metaplastic transformations secondary to chronic inflammatory thyroiditis; or (3) a dedifferentiation of existing anaplastic, papillary, or medullary carcinomas.1,3-5 The latter of these theories has led some to consider PSCCT as a variant of anaplastic carcinoma, although the association of PSCCT to anaplastic carcinoma remains unclear. PSCCT tends to affect females in the seventh decade of life.6 Patients often present with a rapidly enlarging neck mass and compressive symptoms such as dyspnea, dysphagia, and hoarseness,7 all of which were present in our case. PSCCT is a rare but aggressive malignancy of the head and neck, with few reports in the literature. Histopathologic and immunohistochemical evaluations are essential for diagnosis. While locoregional surgery and radiation therapy may improve the length of survival, the prognosis of patients with PSCCT is poor. Physicians should be mindful of this unique but devastating disease, as early diagnosis and rapid treatment initiation are essential to optimize treatment outcomes. This paper was presented as a poster presentation at the American Academy of Otolaryngology—Head and Neck Surgery Foundation 2018 Annual Meeting on October 7-11, 2018 in Atlanta, GA.
. Primary squamous cell carcinoma of the thyroid: case report and systematic review of the literature. Int J Surg Case Rep. 2017;37:36-40. doi: 10.1016/j.ijscr.2017.06.011.
. Primary squamous cell carcinoma of the thyroid gland: report of a case and review of the literature. Am Surg. 1964 Apr;30:247-252. Squamous cell carcinoma of the thyroid gland: primary or secondary disease? J Laryngol Otol. 2011 Jan;125(1):3-9. doi: 10.1017/S0022215110002070.
. Primary squamous cell carcinoma of thyroid: a rare entity. Case Rep Pathol. 2015;2015:838079. doi: 10.1155/2015/838079.
. Primary squamous cell carcinoma of the thyroid gland: an entity with aggressive clinical behaviour and distinctive cytokeratin expression profiles. Histopathology. 2001 Sep;39(3):279-286.
. Primary squamous cell carcinoma of the thyroid: a population-based analysis. Otolaryngol Head Neck Surg. 2017 Jul;157(1):25-29. doi: 10.1177/0194599817698436.
. Primary squamous cell carcinoma of the thyroid gland: a case report and review. Head Neck. 2013 Oct;35(10):E299-E303. doi: 10.1002/hed.23152.
. Primary squamous cell of the thyroid-an abbreviated clinical presentation. J Otolaryngol Head Neck Surg. 2014 Jun 18;43:17. doi: 10.1186/1916-0216-43-17.
. Squamous cell carcinoma of the thyroid: outcome of treatment in 16 patients. Eur J Surg Oncol. 1999 Dec;25(6):606-609.
. Primary squamous cell carcinoma of the thyroid. Eur J Surg Oncol. 2002 Feb;28(1):42-45. Diagnostic significance of PAX8 in thyroid squamous cell carcinoma. Endocr J. 2015;62(11):991-995. doi: 10.1507/endocrj.EJ15-0226.
. PAX8 immunostaining of anaplastic thyroid carcinoma: a reliable means of discerning thyroid origin for undifferentiated tumors of the head and neck. Hum Pathol. 2011 Dec;42(12):1873-1877. doi: 10.1016/j.humpath.2011.02.004.
. Anaplastic thyroid carcinoma: morphologic findings and PAX-8 expression in cytology specimens. Acta Cytol. 2010 Sep-Oct;54(5):668-672.
. Squamous cell carcinoma of the thyroid gland. Am J Surg. 1988 Jul;156(1):44-46.